Weather permitting, North McDonough Street and the Candler and McDonough intersections at East Howard Avenue and College Avenue will be milled in preparation for final resurfacing starting on Monday, July 17. The work should take 2-3 days. This work is part of the North McDonough Streetscape Improvements and the Railroad Crossing Improvements at Candler and McDonough Streets. North McDonough and the two intersections will remain open to two-way vehicle traffic. However, there will be temporary lane closures and minor delays during the work. 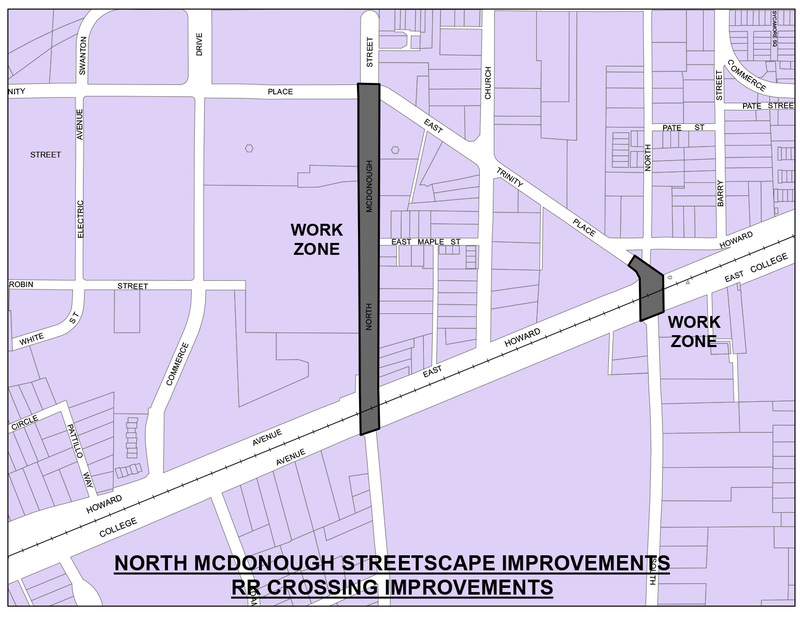 The North McDonough Streetscape Improvements include reducing North McDonough to two vehicle lanes, providing for wider sidewalks, and installing a 2-way “cycle track” on the west side of the street, along with traditional streetscape improvements and on-street parking. The project also features significant “green infrastructure” improvements to improve storm water quality. The Railroad Crossing Improvements will significantly improve accessibility and safety for pedestrians and bicyclists, further encouraging those who live in Winnona Park, the McDonough-Adams-Kings Highway community, and other neighborhoods south of the CSX rail corridor to walk and bike into downtown Decatur. The improvements will provide gentler slopes on the north side of both crossings resulting in an accessible path for persons in wheelchairs or those using strollers, and a much safer route for all located outside the railroad crossing gates. Presently, pedestrians and bicyclists have to share the roadway with vehicles at these crossings. In addition to improvements at the crossings, there will now be new pedestrian crosswalks where none presently exist — on the east side of both intersections and just north of the Candler crossing connecting to the sidewalk along the old Depot property. Finally, improved vehicular mobility is also a project priority. Both crossings will include new traffic signals on both sides which will allow protected left turns on all legs of the two crossings. The work area is shown below. Click for larger view.